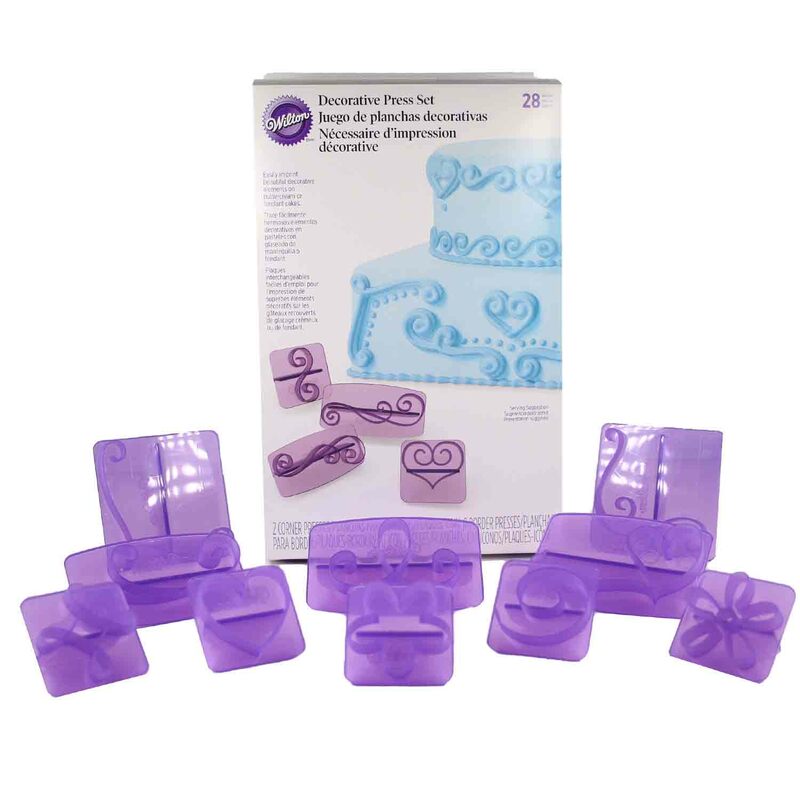 Brand: Wilton 2104-0239 Units: 1 set/ 28 pcs. Easily imprint beautiful decorative elements on buttercream or fondant cakes. Whether you want a simple piping design, or a more elaborate pattern, this collection of design presses is the perfect tool. Each press alone creates a design imprint in icing, but multiple corner, border and icon designs work perfectly together as well. Also works great with cookie dough. Set includes 28 different decorative designs. Corner pieces measure 2 1/4" to 2 1/2", border pieces measure up to 3" long, and icon pieces measure about 1 1/2" wide. Easily imprint beautiful decorative elements on buttercream or fondant cakes. Whether you want a simple piping design, or a more elaborate pattern, this collection of design presses is the perfect tool. Each press alone creates a design imprint in icing, but multiple corner, border and icon designs work perfectly together as well. Also works great with cookie dough. Set includes 28 different decorative designs. Corner pieces measure 2 1/4" to 2 1/2", border pieces measure up to 3" long, and icon pieces measure about 1 1/2" wide.